Clients take comfort knowing that we stand out among our peers. We develop creative strategies to produce big results. 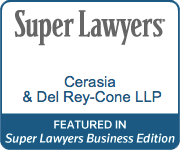 Cerasia & Del Rey-Cone LLP was founded by two talented and successful employment lawyers: Edward Cerasia II and Christie Del Rey-Cone. Ed and Christie are known nationally for their outstanding trial and appellate skills, cutting-edge legal strategies, trusted advice, quality and cost-effective service, and focus on achieving their client's goals, whether that is to settle early or try a case to a successful verdict. They have the experience that counts. Companies and individuals are comfortable putting their trust in Ed and Christie, who stand out among their peers. 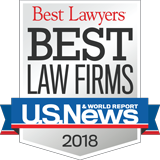 Year-after-year, Ed and Christie are recognized by clients, judges and peers as leaders in employment law, as evidenced by their inclusion in industry-leading directories such as Chambers USA, Best Lawyers or New York Super Lawyers. 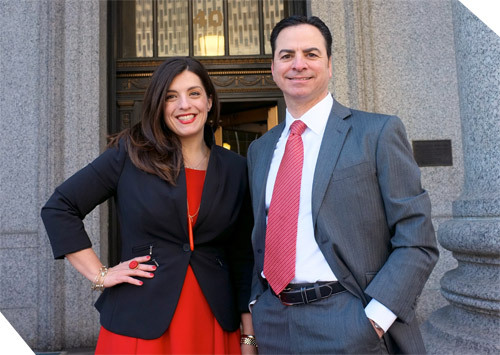 Ed and Christie have significant experience handling single-plaintiff, multi-plaintiff and class action cases involving employment discrimination, harassment, retaliation, whistleblower, wage and hour, employee benefits, stock options, restrictive covenant, breach of contract and employment tort claims. They also counsel clients on day-to-day issues, such as employee discipline and termination, workplace investigations, wage and hour compliance, executive agreements, severance agreements, employee recruitment practices, and benefit plan determinations. Between the two of them, Ed and Christie are admitted to practice law in New York, New Jersey, Connecticut and Pennsylvania, and they have handled cases in 26 states. Ed and Christie are powerful and effective advocates. They give clients personal attention and prepare cases for trial from the start of an engagement. Being trial-ready gives their clients the edge and allows them to achieve their clients' goals through early settlement or verdict. Trust. Talent. Trial-Ready. That's why clients hire us for their most important employment law matters.